Happy Thursday Ya'll. This week has been crazy busy for me but I'm so excited to finally post about this awesome white on white look from Shop Tobi (all shopping links will be down below.) I wanted to give a very clean, crisp color like white a warmer, 70's touch. I threw on these white snake skin boots and yellow sunglasses to complete the look I was going for. I feel like this would be perfect for a night out or with sneakers for a day out on the town. So comfy, and perfect for tropical climates like Florida. 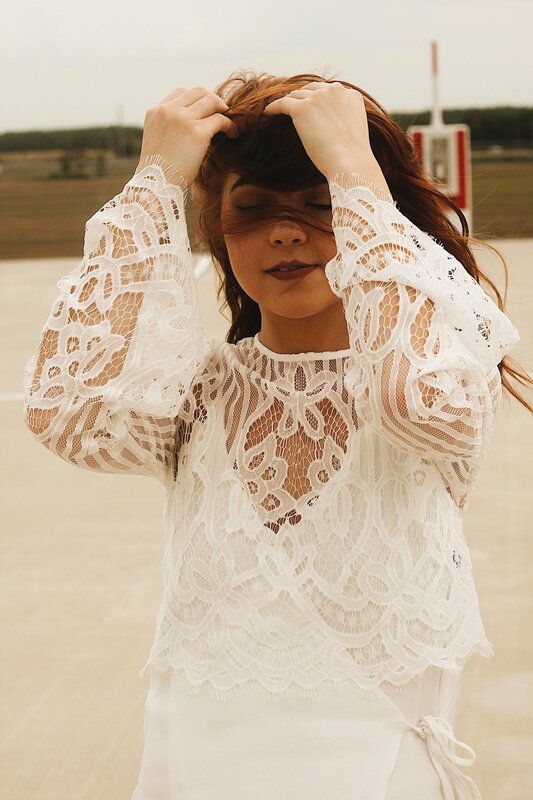 I also am usually not a lace lover, but I love the bell sleeves on this lace top, it really adds that 70's vibe and I couldn't help but feel angelic. We shot in Orlando, Fl on a cloudy day (mainly because my roommate wanted to shoot some looks too so I said why not?) I love the parking garage looks cause it really showcases that city vibe I usually go for. I can definitely say I'll be wearing more white this summer. What trends/style/colors are you going to be rocking this summer? Let me know in the comments below. If you want to shop my look, check down at the very bottom for direct links. But let's stop chit-chatting and get to the fun stuff. Enjoy!